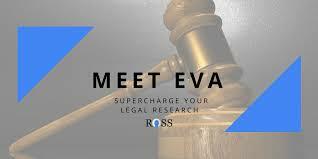 ROSS says EVA will supercharge a lawyer’s research. As of this writing, I have seen a demonstration of EVA, but have not yet used it. However, based on the demonstration alone, and on the simple fact that EVA is free to use, I cannot imagine ever again filing a brief or reviewing an opponent’s brief without running it through EVA.